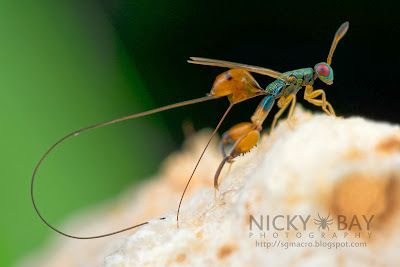 Ovipositing Podagrion, photographed by Nicky Bay. Podagrion is a cosmopolitan genus of wasp parasitising mantid oothecae, with each larva consuming one host egg during development (Bouček 1988). Characters (from Bouček 1988): First flagellar segment transverse, anelliform; only one (median) carina between hind coxae; hind coxa and femur relatively very long, hind femur toothed on ventral edge; apex of hind tibia beyond tarsal insertion forming a produced spine that is less than twice as long as the tibia is broad, only one distinct spur; ovipositor always much longer than gaster.